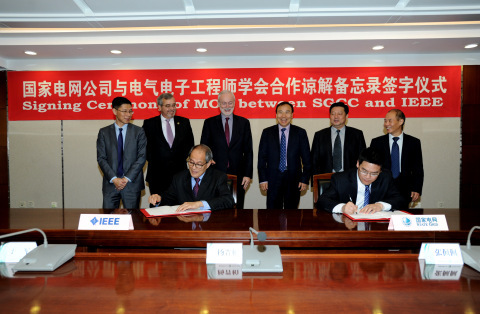 PISCATAWAY, N.J.--(BUSINESS WIRE)--The Institute of Electrical and Electronics Engineers (IEEE), the world’s largest technical professional organization, and The State Grid Corporation of China (SGCC) signed a Memorandum of Understanding (MOU) on November 27, 2017 in Beijing, China. Mr. Jinbai Yang, Vice President of SGCC, and Professor Saifur Rahman, President 2018-19 of the IEEE Power & Energy Society, signed this MOU and held talks on mutual cooperation. IEEE and SGCC have common objectives on international activities in the areas of power and energy, especially smart grid, UHV (Ultra High Voltage) transmission and other relevant topics. Both parties are committed to achieving the goals of improving, guiding, innovating and promoting the development of technology in the areas of power and energy. According to the MOU, SGCC will become a corporate member of the IEEE Power & Energy Society (PES) and an Advanced Corporate Member of the IEEE Standards Association (IEEE-SA). In addition, both parties will cooperate in joint activities including the exchange of information, high-level visits, co-hosted international conferences, the development of international standards, and training of employees, etc. Representatives from IEEE PES and the IEEE China office, the International and Technical Departments of SGCC, and China Electric Power Institute attended the signing ceremony and discussions. IEEE is the world's largest technical professional organization dedicated to advancing technology for the benefit of humanity. Through its highly cited publications, conferences, technology standards, and professional and educational activities, IEEE is the trusted voice on a wide variety of technological areas ranging from aerospace systems, computers, and telecommunications to biomedical engineering, electric power, and consumer electronics. Learn more at http://www.ieee.org. The State Grid Corporation of China (SGCC) is the largest public utility in the world. SGCC’s core business is to build and operate power grids and provide secure, reliable, economic, clean, and sustainable power supply for the development of the society. Its service area covers 26 provinces, autonomous regions and municipalities, the area of which equals to 88% of the national territory. SGCC has 1.6 million employees and serves a population of over 1.1 billion.